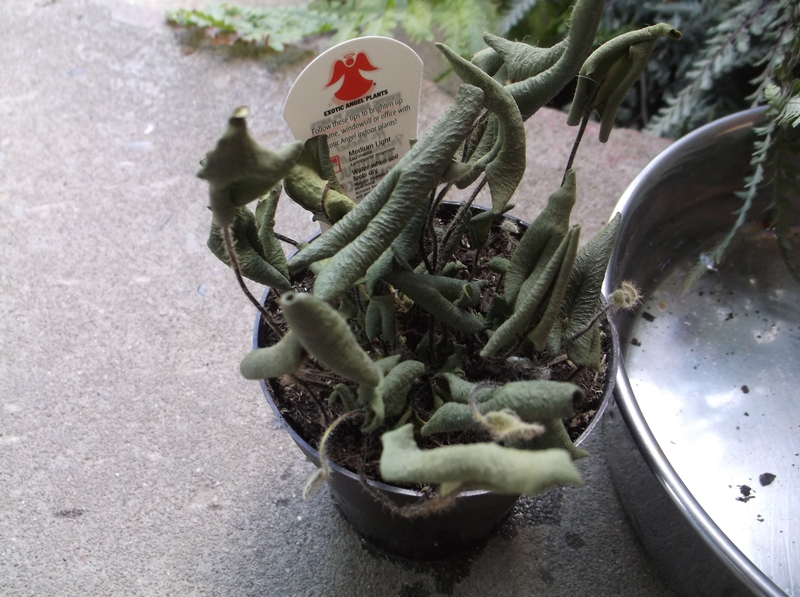 I forgot to water this poor fern – not once – but TWICE! But since it didn’t turn brown or feel crispy, I put it in the dog dish to water it and see what might survive. It took 3 days the first time and 2 days the second time, but this little fern survived my neglect. 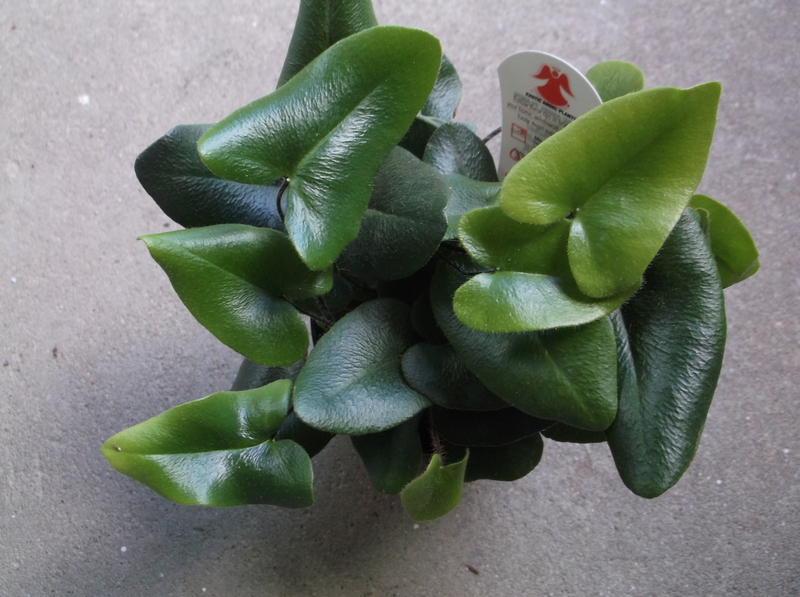 Time for me to pick a pot and get this sweetie in a proper home! 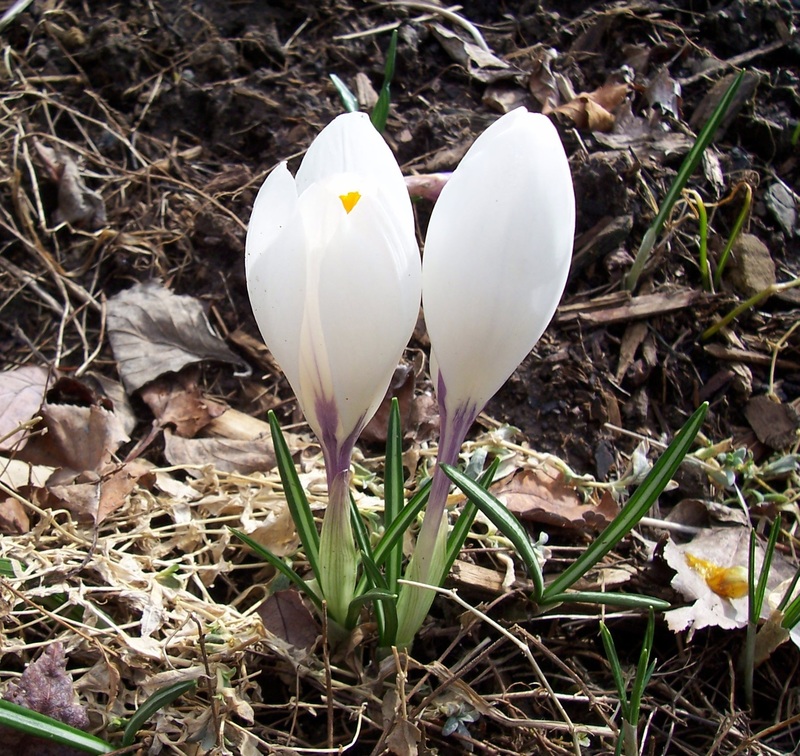 As I was outside with the energizer bunny (Ryder), the sky darkened and small wee bits of snow swirled in the wind. 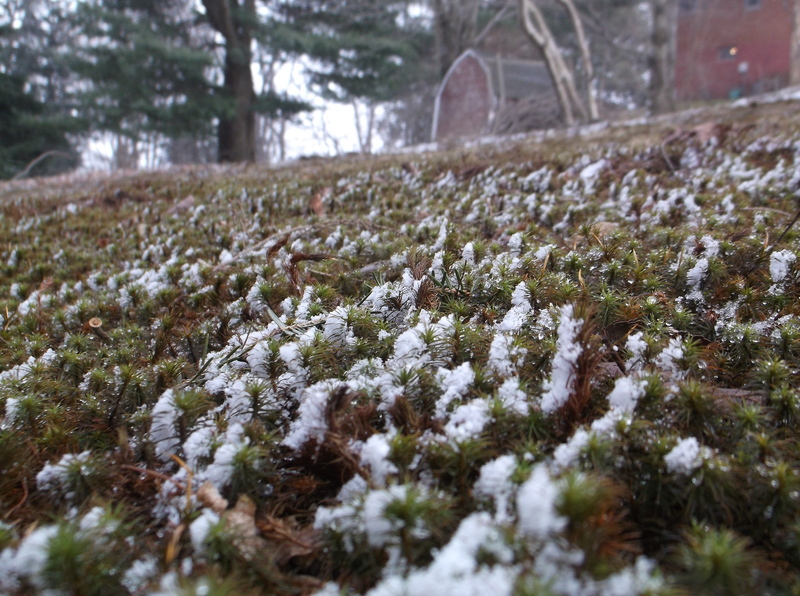 It lasted only 5 minutes, but that was long enough to coat the moss in our yard in waves of white frosting. 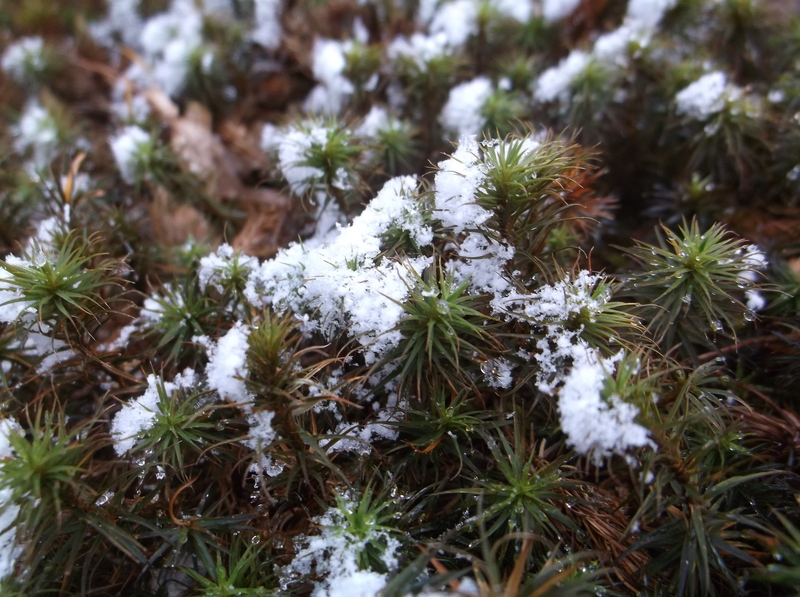 Notice the little wavy pattern of the snow and how it’s stuck to just one side of the moss. Unfortunately, it came in 5 minutes and then left in 5 minutes. The temperature was exactly 32 degrees farenheit and the sun was peeking off and on through the clouds just enough to melt everything it touched. 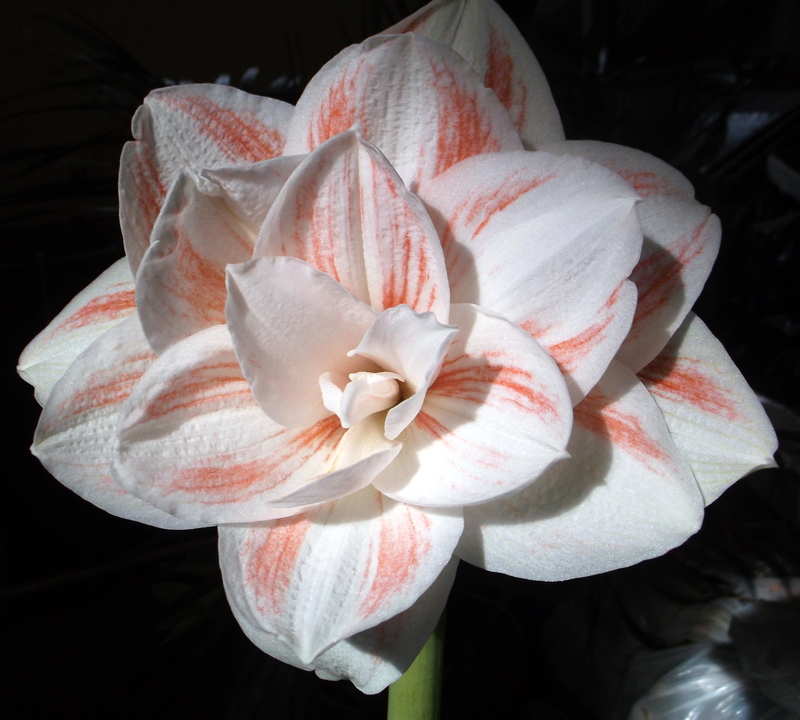 Three of my Amaryllis bulbs were big enough to bloom for me last month. Enjoy! 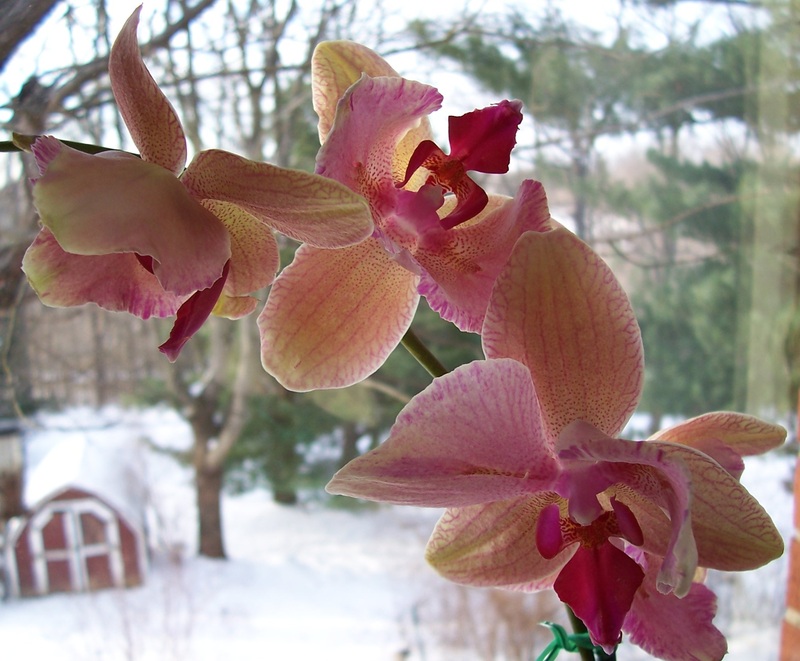 We were somewhat concerned about whether any plants would survive this winter. Not because it was too cold, but because it was too warm. The plants were fooled into thinking it was April in December. 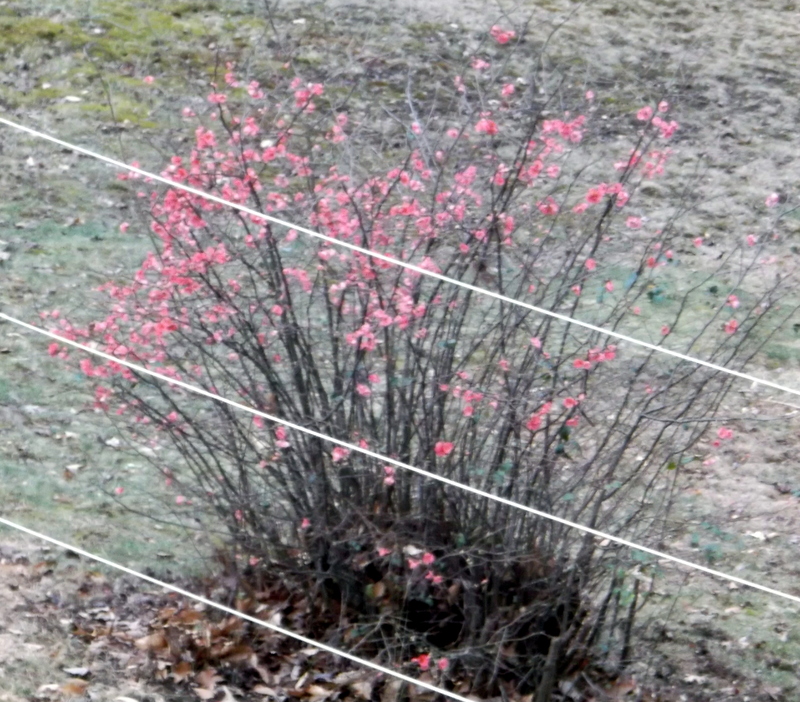 My crabapple bush even bloomed. 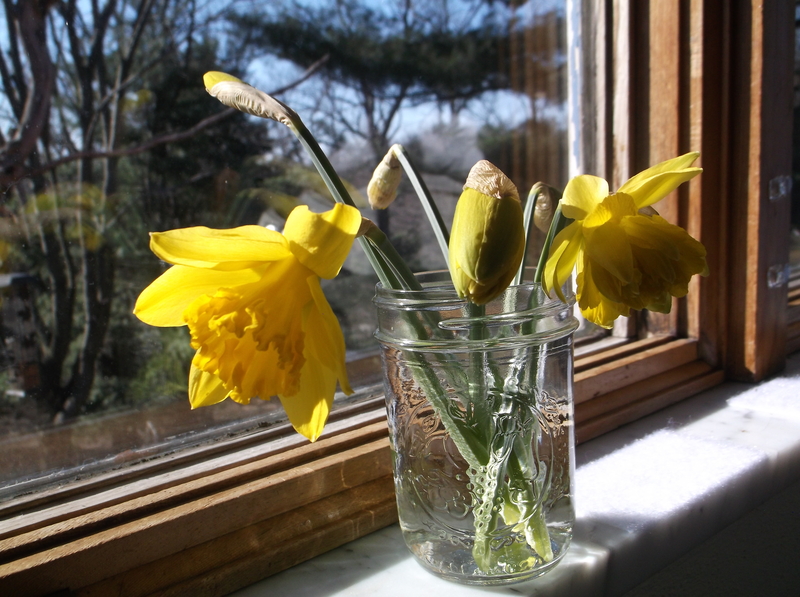 And my daffodils were up waaay too early. 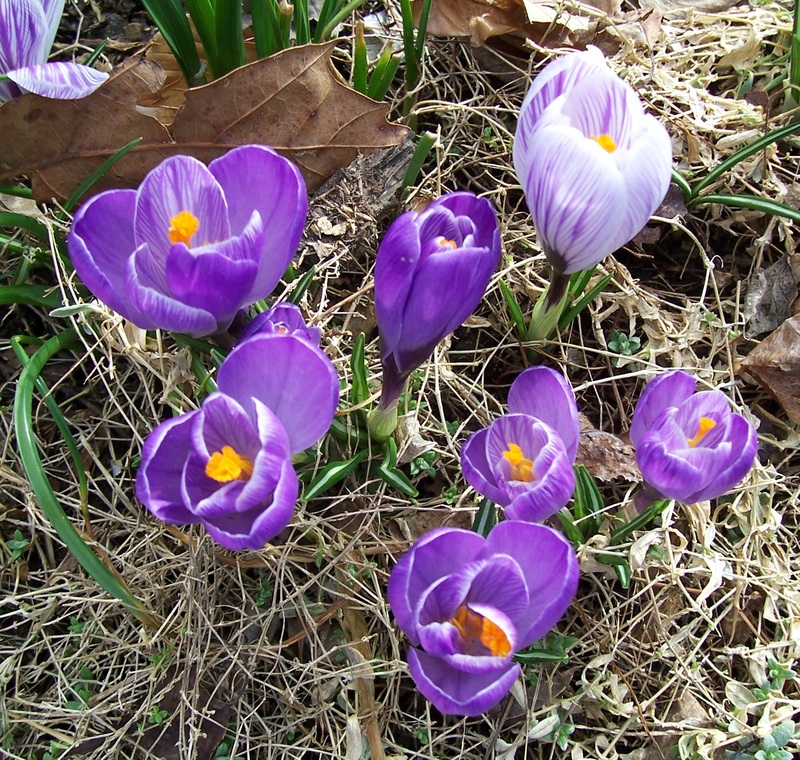 I still don’t know the fate of my shrubs and perennials, but my bulbs survived! 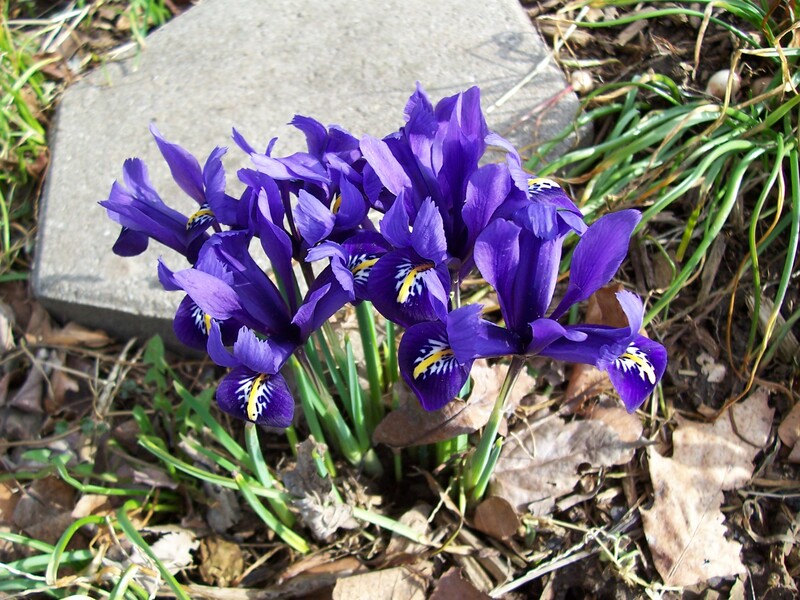 Unfortunately, before I could get pics of my crocus and small iris a rain storm blew through and flattened them. Fortunately I have pics from last year that never got posted! 😀 Enjoy the beginning of spring! 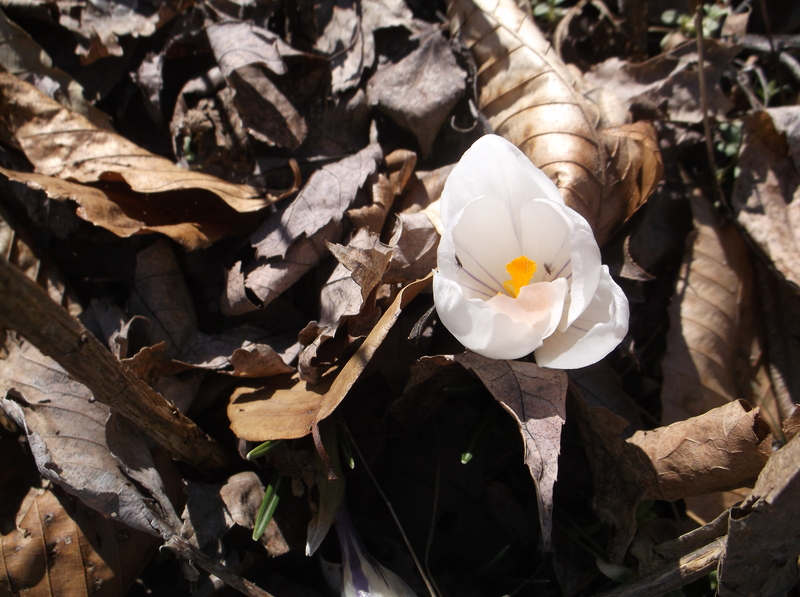 Lone crocus survivor from this year. 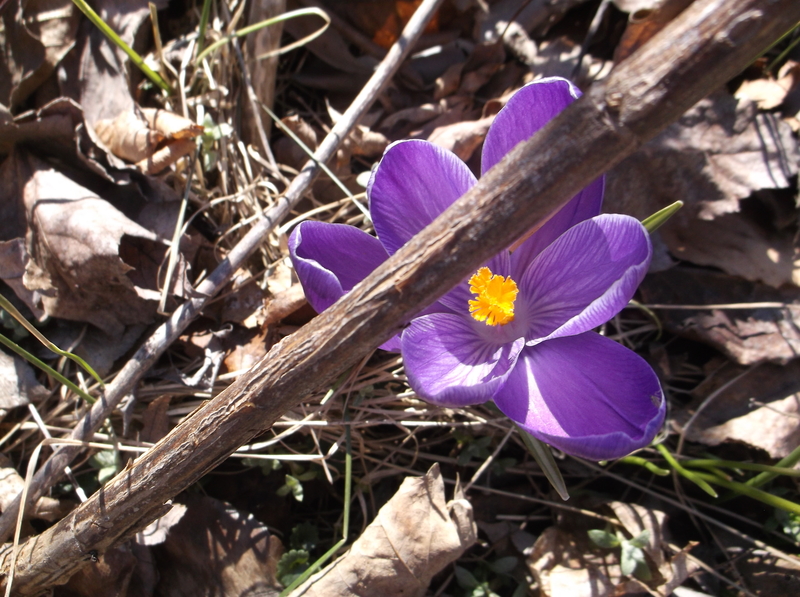 Hope your spring is treating you well! The weather here has been sooo screwy. Temperatures in the 50’s one week then down to the twenties the next week for months. It was like this to a lesser degree last year and I lost 1/3 of my plants. They never got to sleep properly. 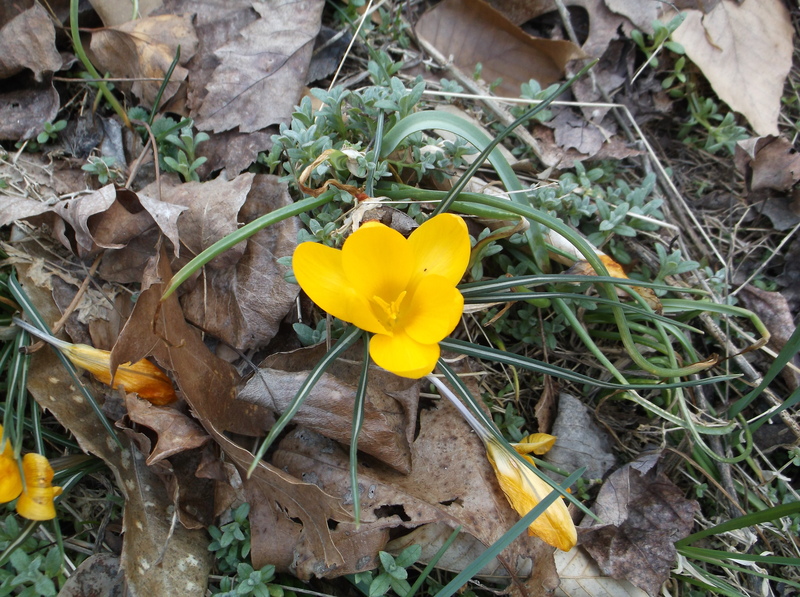 But with the extremes this year, the plants are thinking it’s spring already. This was what I was looking at for three weeks through Christmas. My crabapple bush in bloom. In December. 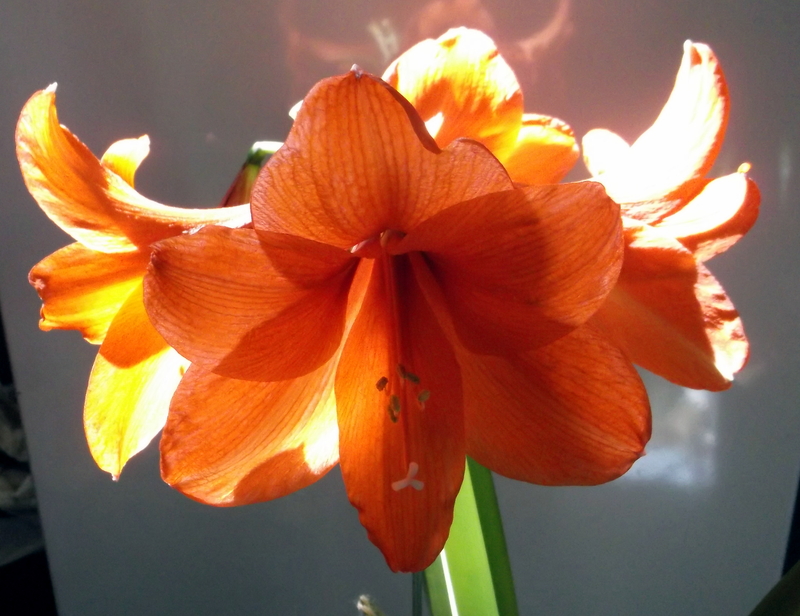 It’s not supposed to bloom till April / May. 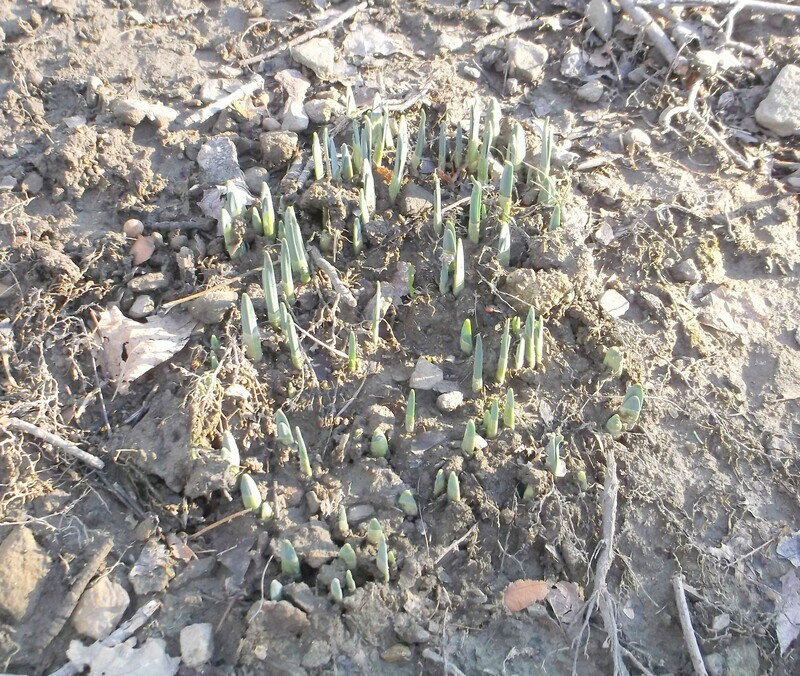 My daffodils are coming up. In December instead of March. We just dropped down into the twenties and teens this week. No more crabapple blooms. And maybe no more crabapple bush. And, yes, that is a dusting of snow on the ground. I was putting photos into my Blog folder and looking down at the bottom of the screen I found I had over 250 pictures in the folder. Holy crap. So while I haven’t been posting like I used to, I hadn’t totally stopped thinking about it. Of course, some of these pix are old, unused photos because I never got around to writing the post I was thinking about, but there are a ton of animal and flower pictures as well. I’ve decided to start cleaning out the folder and posting the pics that have no special post attached to them. Ten at a time seems comfortable to me. Enjoy! 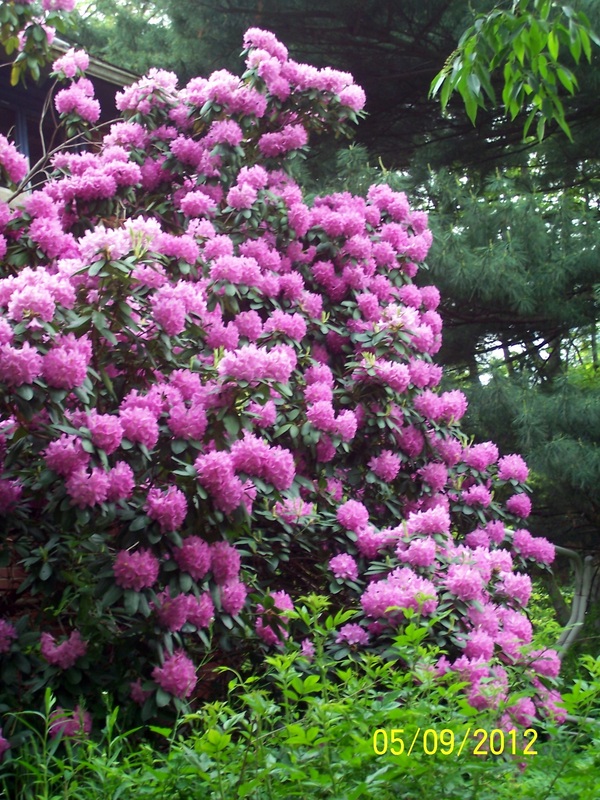 Our rhododendron bush 2 stories high. It no longer exists as it was torn out to put in sewage lines. I love butterfly bushes. 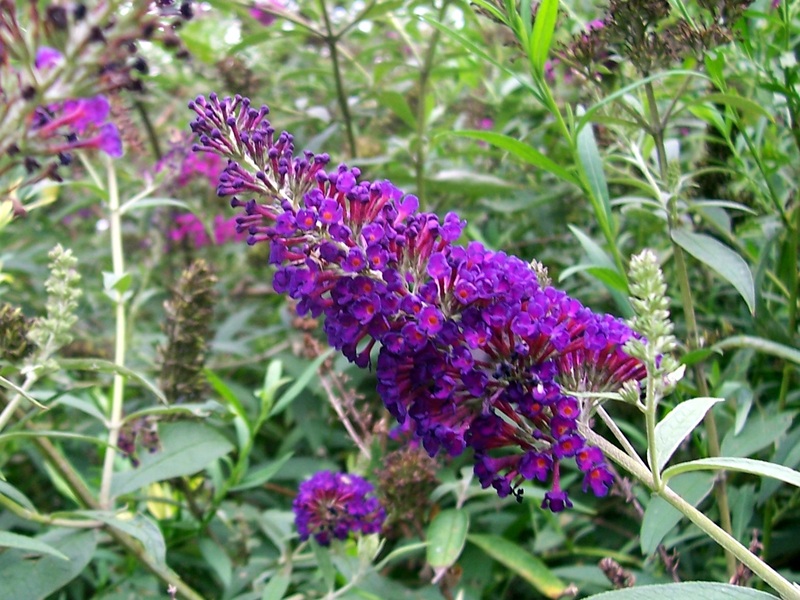 If you want something that will guarantee you lovely winged visitors, put in a butterfly bush. I have four. Don’t be intimidated by their size. 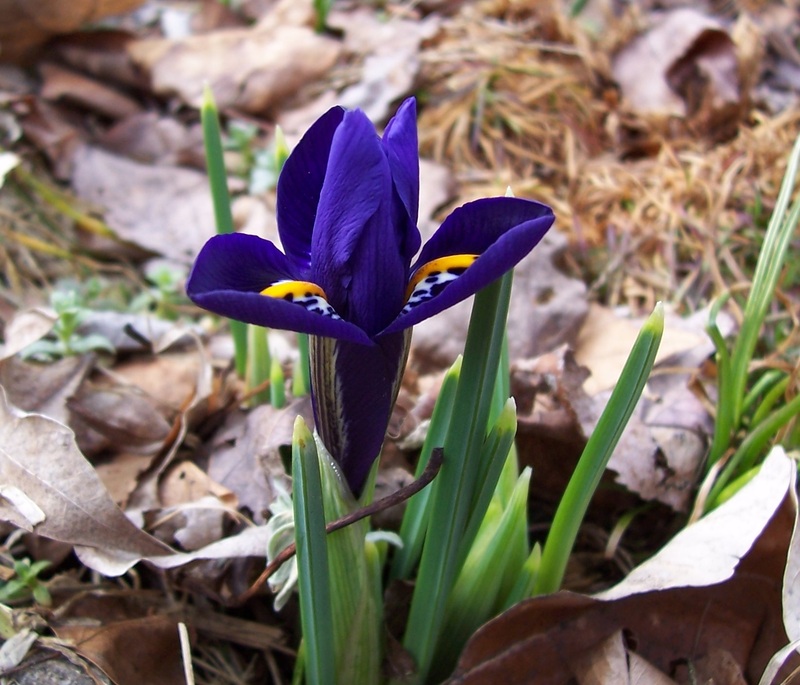 You can cut them down to 18″ inches every spring. One year for fun, I cut off all the branches below 2 1/2 feet and any branches pointing down. 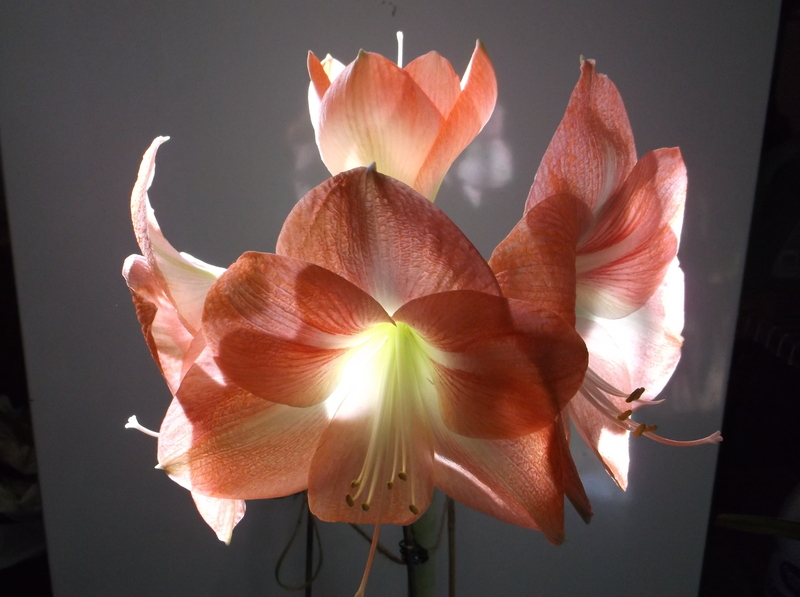 They looked like giant candelabras when they bloomed! 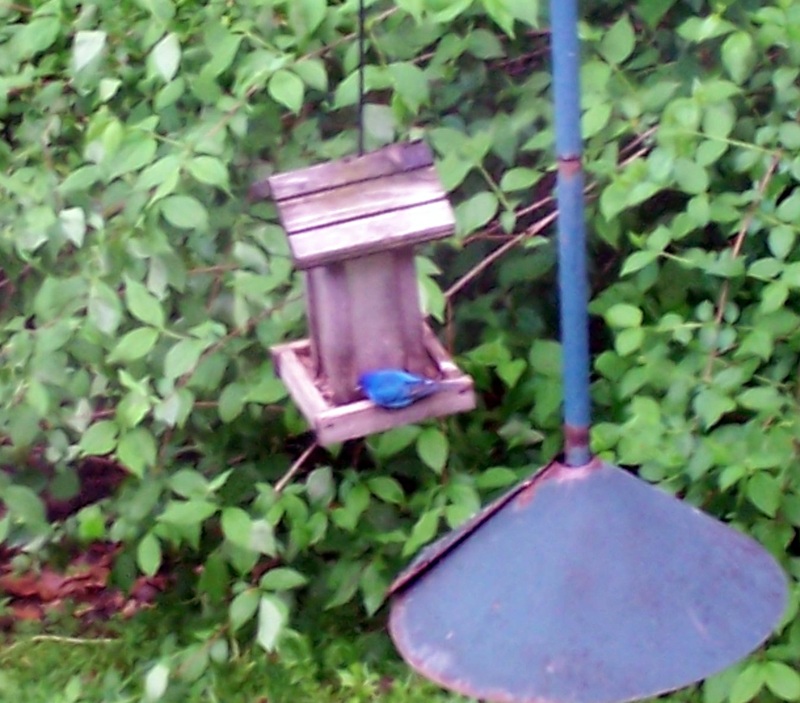 Blurry but still beautiful, an Indigo Bunting. We occasionally get these coming through in early summer. They are so lovely, but also very shy. I took this picture from the kitchen and he still spotted me and took off. 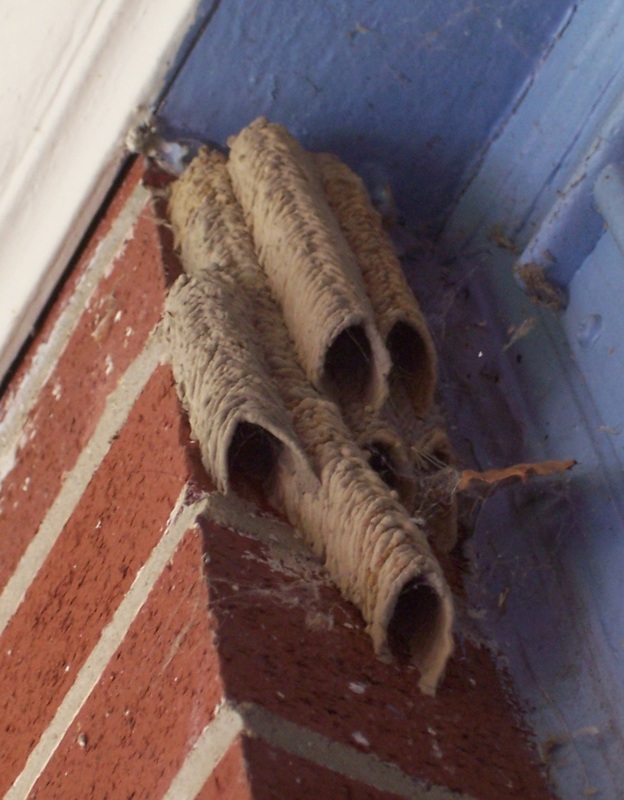 These are the nests of the Organ-pipe (or pipe organ) mud dauber. Yes, that’s on my house and I left them there. They originally started this nest at face level outside my front door. Since I experience lingering pain with wasp stings, I was not impressed. But it totally ignored me when I opened the door which surprised me and made me curious. In looking up this wasp I found they are non-aggressive and won’t sting unless hurt. But face level at the door wasn’t going to work with the rest of the family, so I scrapped off the nest and sprayed lemon pledge on the brick. They then moved the nest up into the corner and I let it be. Did you know they hunt spiders to put in the nest for the young to eat? The adults drink nectar from flowers. Go here to find out more about this remarkable wasp. 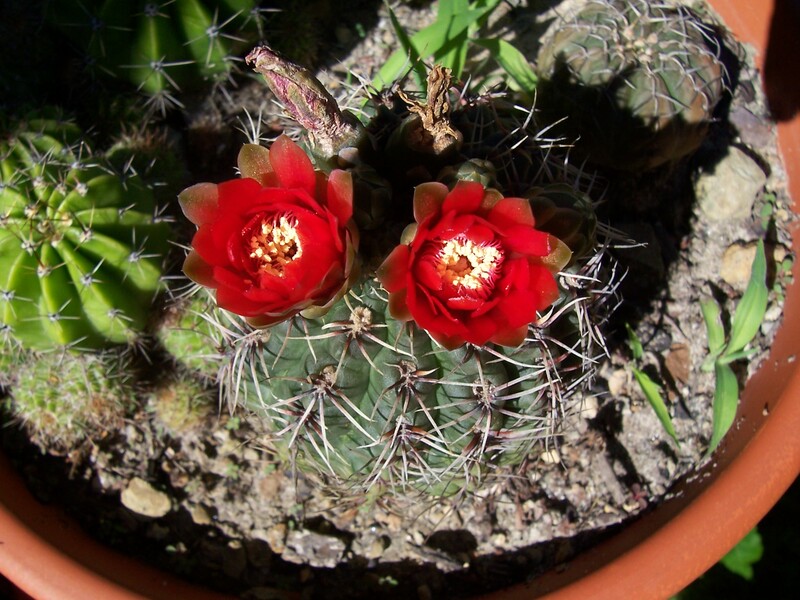 I’ve had this cactus for an untold number of years and two years ago it finally bloomed. 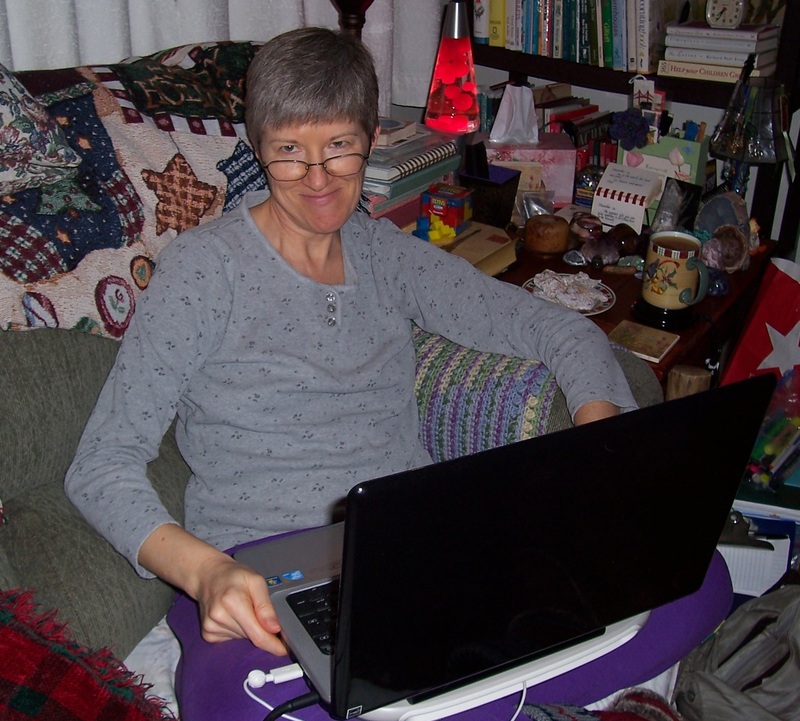 Me working on the couch. Judging not by the throw behind me – I can have Christmas out till February – this is the week after Christmas. How do I know? Check out the plate of cookies. My BFF makes pfeffernusse cookies for us every Christmas and they generally don’t make it to New Year’s! 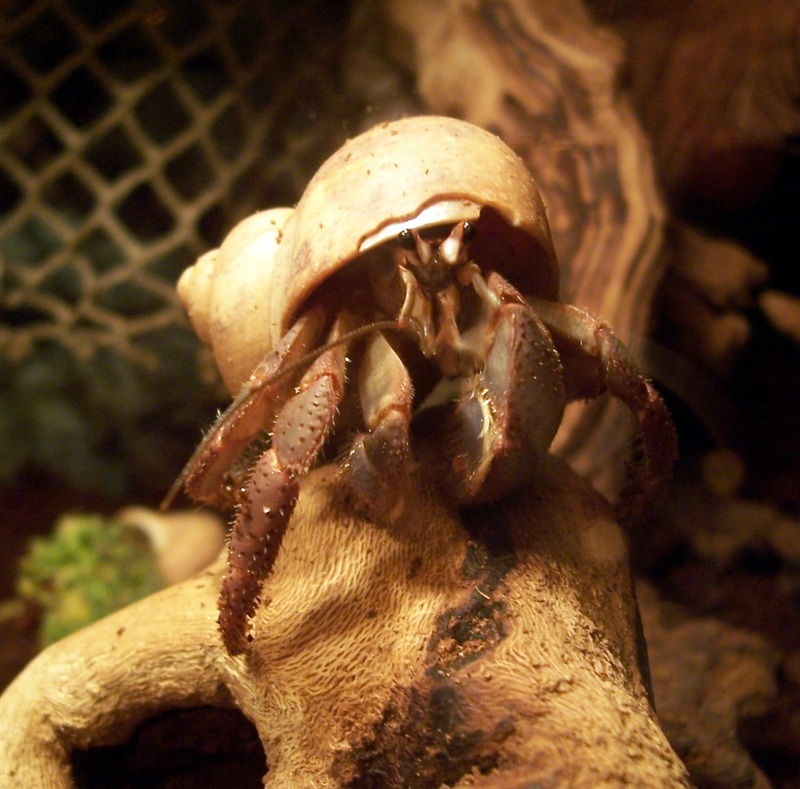 Hermit crab on the prowl. Love these little guys! 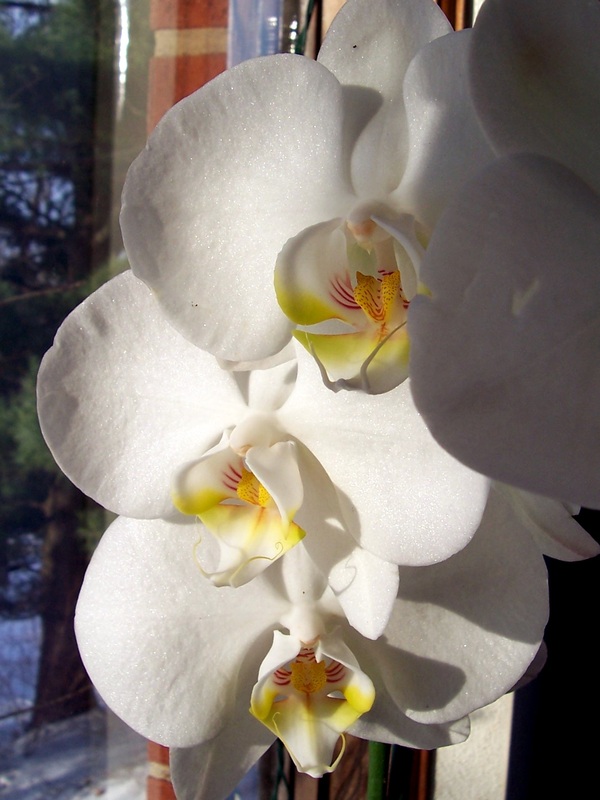 Phalaenopsis orchid from a couple of winters ago. 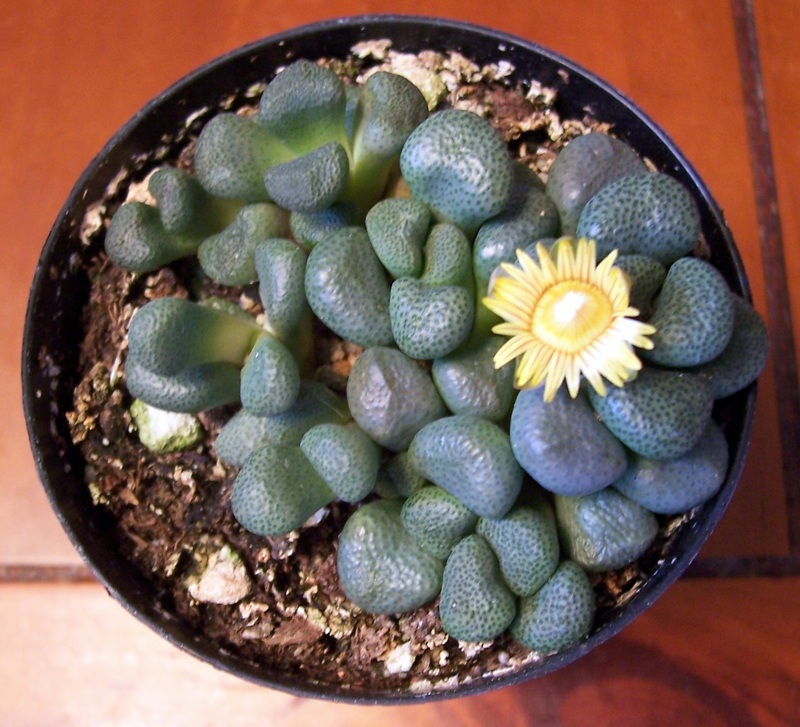 A small succulent that bloomed even before I put it in a proper pot. 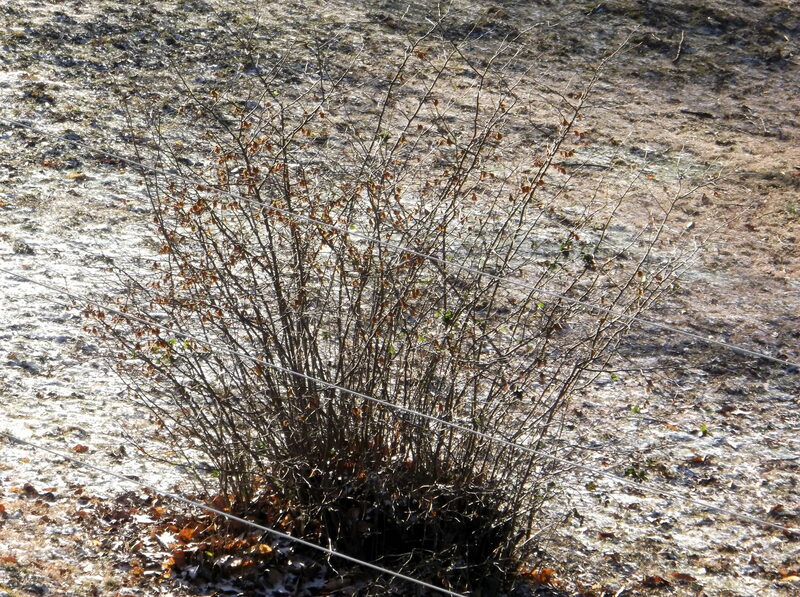 Unfortunately, it was one of over 20 plants that did not make it through this winter.